Grapplers are people too. In the past, I have thought and said this many times, with the emphasis on the last word. For a long time, I felt the need to defend this passion of mine to people who found it violent or distasteful or otherwise something they did not want themselves and theirs to be around. It is in part because of these early reactions to Brazilian Jiu-Jitsu that I have consciously decided to do my best to be a force for good in this world. I believe it is possible to give expression to our most basic instincts while still appealing to our higher natures. Indeed, to me that is actually a great description of jiu-jitsu: an expression of human’s most basic survival and aggression instincts that simultaneously appeals to our higher order thinking skills and our capacity to strategize and plan. I am glad to say that many people feel the same way I do about this, and I am fortunate to be surrounded by them in my jiu-jitsu world. More recently, I have come to realize that I and others like me also say the above phrase with the emphasis on the THIRD word. 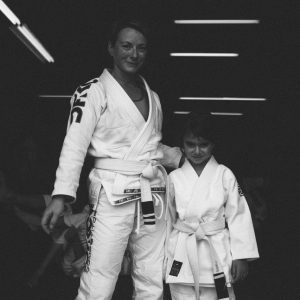 Early in my training career, I cared only about what my partners could do on the mat. Yes, I became friends with some of them in non-training hours, but for the most part, I was all about who could help with my pressure passing and who could help with my half guard sweeps and who could help with my triangle setups—and who I could successfully execute those things on. I was less interested in the fact that in addition to having a nasty collar choke, Person X was in a heavy metal cover band, or that when she wasn’t attacking my feet like a piranha, Person Y was a patent lawyer. But now, as an instructor, I have come to be far more interested in the care and feeding of the entire grappler. I recognize more now that people bring themselves to the mat—not just their skills (or “skillz”), but their personalities and their priorities. You could even say they bring their identities to the mat, and those identities influence how, why, and when they train. Recognizing that grapplers are people too helps me be a better instructor and training partner. It helps me make more of a connection with students. And it is just plain more fun. I have listened to stories from training partners about their days as undercover cops, watched videos of hilarious things their kids did that day, and heard interesting perspectives from them on current events that are in their fields of expertise. You could argue that this has nothing to do with jiu-jitsu, but I would say that it has quite a lot to do with it. These people are my community, not just body parts for me to attack and be attacked by. I do not intend to imply that a focus on community trumps or displaces a focus on high quality training. Rather, the two can go hand-in-hand, and that can result in a synergy that is rewarding for everyone. Case in point: Princeton BJJ’s very own Art Keintz is putting together an expo featuring artists, writers, and performers from our very own mats. The idea is to showcase some of the other ways our grappling-talented students and instructors express themselves and make the world a prettier place. I love this idea because it gives everyone an opportunity to get a load of each other outside the confines of the gi and/or spats. If you are in the area, come join us on Saturday, December 9, 2017, 7-10pm at Princeton BJJ, and learn more about what makes PBJJ grapplers people too.